Cannabis indica and Cannabis sativa are the two main species of Cannabis plant. Both strains have high levels of THC which makes them awesome for getting high! There is also a third species called Cannabis ruderalis. Ruderalis has very low concentrations of THC and is only used for creating autoflowering hybrid strains with indica and sativa. In this post, we’re going to look at indica vs sativa and compare their physical appearance, effects and type of high, medical uses, and genetic origins. It’s worth noting that very few of the weed strains you buy or grow to smoke are 100% indica or sativa. Almost all of them are hybrids that contain different percentages of sativa vs indica. Breeders combine the strains to create new varieties that have particularly desirable properties. Indica plants are shorter, bushier and more dense than sativa plants and can grow to between 3 and 6 feet in height. For this reason, they’re great for growing weed indoors because there’s much less chance they’ll grow tall enough to hit your grow lights in your grow room or grow tent. Indica leaves are shorter, fatter and are a darker shade of green than sativa leaves. Sativa plants are generally taller and thinner than indica plants with less dense foliage. They can grow up to 15 feet high! This makes them great for growing weed outdoors, because you’re much less likely to be worried about height restrictions. Sativa leaves are longer, thinner and generally a lighter shade of green than indica leaves. What type of high do you get from smoking Indica vs Sativa? Indica strains give a full body high or body buzz and have a relaxing and sedating effect on the entire body. When smoking strong strains, this can lead to ‘couch lock‘, where you get so relaxed and sedated you literally can’t get off the couch! Indica weed makes you feel relaxed, mellow, calm and sleepy. Because of their sedative effects, indica strains are best smoked at night when bed is a short distance away. Sativa strains give an uplifting, energetic head high that’s felt much less in the whole body than indica strains. They also tend to have more ‘spacey’ hallucinogenic effects than indica. Sativa weed makes you feel more creative, energetic, social and talkative. Because sativa strains give you an energetic head high and don’t sedate the body, they are much better for smoking during the day when you need to stay active and alert. Indica strains generally have a high level of THC vs CBD. The high levels of THC means that some people can suffer anxiety or paranoia when smoking strong indica strains. For others, the relaxing full body effects of indica strains can be use to reduce anxiety. Sativa strains generally have a high level of CBD vs THC. CBD has been shown to have anti-depressant qualities and this is an exciting new area of research. Indica strains tend to flower much faster than sativa and can finish flowering in 45 – 60 days. Sativa strains generally flower in around 60-90 days. 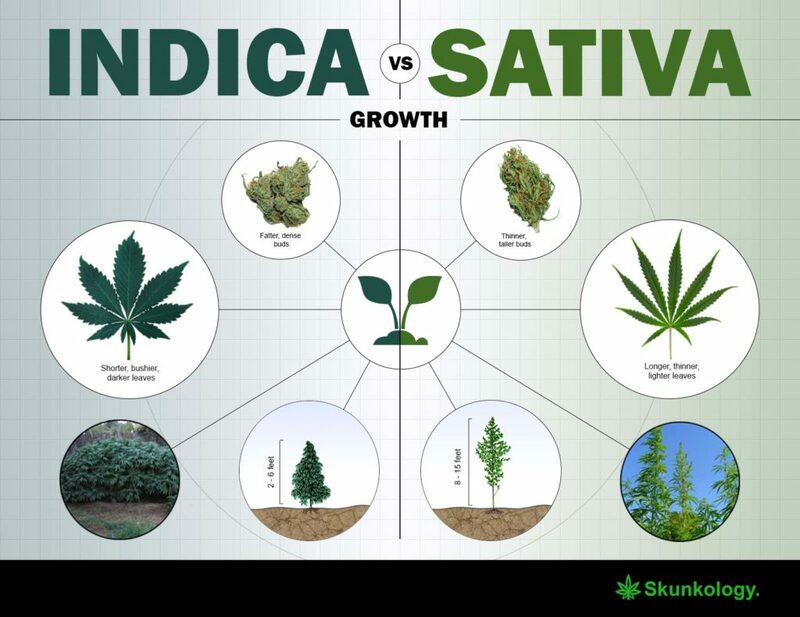 Sativa plants spend less time in the vegetative stage of growth before they begin flowering so the total growth time for indica vs sativa is roughly the same. Indica strains mostly come from central Asia and the Indian Subcontinent (Northern India, Pakistan, Afghanistan). Sativa strains mostly come from tropic regions around the equator (Thailand, Mexico, Southern India). Sativa is often considered the oldest ‘original’ strain but weed has been growing wild for thousands of years so there is unlikely to be one original strain.